Southern California Edison plans to install 250 megawatts’ worth of solar panels on commercial rooftops, generating enough electricity to power 162,000 homes. It’s a potentially game-changing move, one that could lower the cost of solar cells as manufacturers ramp up production to meet the utility’s schedule of installing a megawatt-a-week of arrays until it reaches the 250-megawatt target. That alone is more than United States’ entire production of solar cells in 2006 and will generate as much electricity as a small coal-fired power plant, albeit with no greenhouse gas emissions. “This project will turn two square miles of unused commercial rooftops into advanced solar generating stations,” said John Bryson, CEO of the utility’s parent company, Edison International (EIX), in a statement Wednesday night. The $875 million initiative also marks the first big foray into so-called distributed energy by a major utility. Instead of building a centralized power station and the expensive transmission system needed to transmit electricity to the power grid, Edison will connect clusters of solar arrays into existing neighborhood circuits. A significant hurdle for the massive megawatt solar power plants planned for California’s Mojave Desert is the need in some cases to build multi billion-dollar transmission systems through environmentally sensitive lands to bring the electricity to coastal metropolises. Solar arrays of course only generate electricity when the sun is shining, but they produce the most power during the hottest part of the day when Southern Californians crank up their air conditioners. The arrays could help spare Edison from having to fire up a fossil-fuel power plant when demand peaks. Edison spokesman Gil Alexander told Green Wombat that the utility expects the project’s scale to allow arrays to be placed on roofs at half the cost of a typical installation. Edison’s ambitions could prove a boon for solar cell makers like SunPower (SPWR) and Suntech (STP) as well as solar installation companies such as Akeena (AKNS). One unknown is whether the demand created by Edison will drive up costs in the short term, given ongoing shortages of polysilicon, the base material of solar cells. The Edison project could also help jump-start the market for thin-film solar panels, which typically use far less silicon than conventional solar cells. Alexander says Edison is already negotiating with solar panel makers and installers. Needless to say, the project will up local hiring of green collar workers. Here’s how the solar roofs initiative will work: Edison will lease 65 million square feet of warehouse rooftop space from building owners. (The target area is the fast-growing “Inland Empire” of Riverside and San Bernardino counties.) The utility will contract for the installation of the arrays and will retain ownership of the solar systems. California regulators appear inclined to approve the project, which will be financed by a hike in utility rates. Anyone who has driven through Los Angeles can attest to the endless acres of big-box stores, warehouses and strip malls and thus the potential to generate green power from sun-baked suburban sprawl. Edison’s solar roof ramp up is likely to put pressure on California’s other big utilities, PG&E (PCG) and San Diego Gas & Electric (SRE), to follow suit. Like Edison, they face a state mandate to obtain 20 percent of their electricity from renewable sources by 2010 and 33 percent by 2020. California’s global warming law requires the state’s greenhouse gas emissions to be rolled back to 1990 levels by 2020. The solar pannels will absorb the heat and thereby keep the building cooler too. Nice move! this initiative is absolutely remarkable…it would not be the first time California has led the way and the rest of us will catch up later. Just like the Natural Foods markets. on March 27, 2008 at 11:38 am | Reply T, Austin TX. Interesting that the cost is covered by a utility raate hike. Edison gets to charge users now for installation of infrastructure that will generate free power in the future. Think the rates will go down once the cells are operations? Doubtful! It’s about time the private sector take the initiative rather than wait and wait and wait for politicians and the government to get their act together. Smart move. I can see that this article never addresses the “common sense” problem with solar power. Another power plant of approximately the same size must be built and operated at NIGHT !!! Power demands in CA, like the rest of the USA are 24/7. The “nightime” plant that must cycle up and down to coplement the solar power generated, will, of course, be run on fossil fuels. Wow. It’s 2008 and this is the first time a utility is making use of this obvious space for a large-scale solar installation? Well, better late than never I guess. Hopefully others follow the lead. There’s no shortage of big-box stores and sprawling development across the sun-drenched southwest where this type of project makes perfect sense. It’s certainly a good idea and will help out but solar panels are so inefficient compared to Nuclear power. Sadly many Americans have been duped into thinking Nuclear Energy is dirty when in actuality it’s most efficient power plant we have. Until we can start using geo thermal power Nuclear is by far the most efficient and cleanest form of power production pound for pound of waste. Plus the waste can be recycled and used again. France gets 74% of its electric power from Nuclear plants and they are developing and refining the technology a great deal. Many European countries are following suit as is China and other countries around the world. Yes solar is a great SUPPLEMENT and I like the idea of putting them on office buildings but until they can truly increase the efficiency of panels to something well beyond the dismal 12-14% efficiency I just don’t think it makes sense to force people to use them. They are expensive and costly to install, maintain and use based on how much electricity they actually put out. on March 27, 2008 at 12:18 pm | Reply Matt, Jacksonville, FL. If it wasn’t for the huge capital investment I would have grid tied a system on my house a long time ago. I hope this does in long turn drop the costs associated with panels, and I think they really are missing the residential market. But a good move either way. this is such an awesome idea. it makes way too much sense and there is no downside, the roof space is there, why not use it? I wonder if this would also work in residential neighborhoods around the country. Places where everyone has a 1/4 acre lot and there are 600 or so houses in a small area. I would think it would be an easy co-op to set up, albeit a large initial investment. But while tour away at work, instead of your house heating up, it is staying cooler and the extra power goes to the grid when there is a peak in demand, usually a nice hot sunny day. solar panel deliver a watt only when sunlight strike it.. If foggy day, maybe more like one quarter of a watt, if rainy day, maybe neglible.. No one is telling us about that.. during nightime , of course nothing… starpower, I dont know so it will average out to be only one fifth or less of a watt per advertised watt capacity.. if someone install a megawatt enough for almost a thousand homes, it really means only 200 homes or less on a average basis.. that is why solar panels is so expensive.. The cost of producing solar panels had gone down enough to make it a go ahead idea for the wealthy first now… or your utility company charging you extra for installing solar panels that benefits the businesses… The key is energy conservation, but we are not doing it becuase the unions are too greedy to do conservation work for cheap… the devils are in details when it comes to conservation and nobody is interested in that… excpet dual pane windows or energy efficient componenets which are easiest to install. the bulk of energy conservations are in the small cracks and holes hidden everywhere like your chimney….. there is so much cracks in masonry that you are forever feeding firewood and forgetting about the emissions that firwewood are most notorious for.. Many are sick from firewood smoke, really! Bravo – someone has finally decided to make the move to help save our enviroment – just think if they did that in places like Las Vegas or Phoenix – nah – that’s to easy and makes far to much sense (cents too).. This utility is already generating energy for nighttime demand – from fossil fuels! 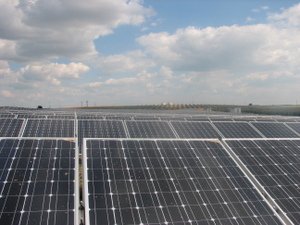 The amount of energy these pannels generate off-sets the amount of fossil fuel a utility would have to use to generate power for nighttime demand. True, I haven’t done the math, but either way, you’re adding energy generation. It makes no sense to say that the utility will now have to construct another plant to handle nighttime demand. Fantastic. Hopefully California will put pressure on other states to follow suit. How much Energy do YOU use when you are asleep? Daytime energy requirements are mainly what drives the building of new power plants. So adding Solar Arrays makes perfect sense. Locating them near where the electricity is needed also reduces losses (wasted watts) in the transmission lines. There was an article in Popular Science (I think the January 08 issue) that featured a CA company manufacturing nano photovoltaics on thin flexible aluminum sheets without costly silicon. It would make sense for any utilities doing major installations to at least check that out. I can’t wait for the day that every roof in this country has solar thermal or photovoltaic capabilities. I’ve about had it with this oil economy we are forced to live with. I just wish I could afford that new roof for our home! Great idea shame that they are passing all of the install costs on the the customers, should use something like a MUD tax where the cost is phased out over time. Notice some in here talking about residential communities doing something, look at solar assisted hot water heaters. You put a panel on your roof like the solar cells but it heats your water, which reduces your energy usage. Also helps keep your house a little cooler by absorbing some of energy hitting your roof. Great part is most people can also take the tax write off but the payoff will take about 5 to 7 yrs. Good job CA on using your head to solve a problem. There’s another benefit to solar rooftops: They reduce cooling costs because they block direct sunlight that would otherwise heat the building. When I lived in Sacramento, the solar-cell covered sun shades in parking lots were always occupied even though people had to walk a bit farther to their cars. And of course, their cars weren’t as hot as those parked in direct sunlight. MJC – Or should I call you glass half empty? You seriously don’t see the value in this idea? So, what do you think we should do; just forget this idea all together and build more big fossil fuel burning plants to cover the day and night time energy demands? No one should feel good about posting anything here if they can’t offer some alternative ideas. It’s easy to say an idea is a bad idea and not offer an idea of your own. Wind, Solar, Water/Wave, BioWaste, Hydrogen, Nuclear all are viable solutions to meet our future energy needs without killing our environment. We have to change the mentality of burning fossil-fuel and thinking that there is only one way to derive the energy we need to power our future. I say pick your favorite alternative energy and put some work into bringing it more mainstream. There is enough variety that if we would all do that, we may end up with 20 solutions for our future energy needs. The multiple solutions will give us plenty of supply and get us to the point where we will not be dependent on any one form of energy. No one who is trying to find solutions, is wrong when it comes to renewable energy in comparison to fossil fuels. Whilst the nay-sayers are quick to point-out that night-time offers no solar energy generation, the simple FACT is that electical power demand peaks during daylight hours. Highest demand occurs (ding – no surprise) during hot sunny weather, driven mainly by air conditioning. Many utilities have online demand graphs, and you can clearly see that demand increases steadily from early/mid morning and starts to decline about 2 hours before dusk when the angle of the sun causes less heating. Prime-time energy demand coincides with prime solar energy production. If we really wanted to stop global warming, we would expedite new nuclear power. Please keep an eye out for the Oil and Coal company ‘spy’ comments (like ‘Gumby’ about 5 posts back)- they are soo easy to see, they read like a moronic fool wrote them and are meant to be read by moronic fools who buy into the nay-say propaganda. They will be all over this article, and Oil and Coal will fight to the bitter end to stop us from using solar. We haven’t seen anything yet from them. Watch out for them! THIS IS THE BEST THING TO HAPPEN SO FAR THIS CENTURY – I believe this has lit the fuse for an explostion of solar, thank god, it’s about time!!! I hope people send out many links to this article, the more people that hear about this the better! This only makes sense if they adopt and enforce a “No Made in China Polysilicon” rule, which, given the cost pressures, I’m afraid they won’t. Recent stories about the rush to produce cheap polysilicon in China have exposed that they do so by foregoing the expensive process of recycling all the highly toxic waste from the production process. What are they doing with it? Dumping it in fields whereever they can where it sickens the local population, destroys the land for farming, and does who knows what to the kids in the area. You can Google the recent news stories. Time to start thinking end-to-end on these “green” projects and look at the whole picture of what’s happening with them. Here’s something else to consider. A few folks have mentioned that solar panels only work during the day. Absolutely true. But, what we’re dealing with here is energy, which once it’s converted from UV energy to electric energy can typically be stored for use at other times. I don’t advocate using batteries much, because they tend to be costly and are tough to maintain over their relatively short lifetime. The best solution in this case would be to create a huge solar farm, similar to that described in this article, and use any excess energy created during daylight hours to pump water into a reservoir. Then, when the sun sets, the water can reverse direction and create power for night-time use. I encourage everyone to share their own creative solutions to the global problem of maintaining productive societies while at the same time protecting the wonderful resources we’ve been blessed with. This is a great plan but what happens when you need to repair your roof? Great idea! I wish the Govenor would stand up to Bush when it comes to electric cars. We need this kind of push to get rid of oil burning cars and get ready for the near future, not 20 years from now. A good “Feel-good” PR piece for ignorant green heads but several comments are most pertinent: Rate hikes to offset development cost will apply to virtually all “green” ventures by utilities so rate payers will not save greenbacks or the environment in their lifetime; Additional reliable power supplies (coal, gas, nucs, whatever)are needed as more wind and solar comes on line because wind and solar feeds an increase only to variable demand and with that increase is the equal demand for reliable back up so wind and solar don’t really reduce hydrocarbon use in the near term-they will actually increase it; and, Ryan from Utah is right on-the cleanest and most efficient reliable source (according to a vast majority of scientists around the world) is nuclear. Nuclear is the back bone (steady power delivery)to the grid. After the grid are the coal-fired plants, a small handful of hydros, then gas-fired as you get closer to population centers because they burn cleaner and are efficient in smaller-scale, localized dsitribution. Unfortunately, special interests got in the way of standardizing facilities which meant each plant had unique and costsly challenges relating to maintenance. Then, public emotion got in the way as a result of the problems from a non-standardized system and no new nuclear plants have been built in the last… 30 years in the US. France standardized their nuclear plants and it has benefited France greatly. Conservation is important. We’re far too wasteful in this country. But, demand for energy, efficent waste handling, commodities and consumables will not decrease as the population increases. (And, utilities passing the buck to rate payers will not ease economic burden.) Duh! What we need are expanded and “permanent” investment and development tax credits for the private sector (not public utilities and government) to drive the expansion of green energy in the US. Despite lower citizenry birth rates, those immigrating to the US have high reproduction rates and regardless of politics or faith, they will be here and they will be increasing the US population and thus consumption of energy. All things must work together for the greater good. Green heads need to embrace responsible hydrocarbon development and understand the necessity of it. Big oil is already embracing green for goodwill and the inevitablity they understand of the limitations of the world’s current oil supply. It’s going to take a concerted effort on all fronts and will all fuels and techonolgies to meet future demand. THE MOST IMPORTANT THING YOU CAN DO IS TO WRITE YOUR ELECTED OFFICIALS AND DEMAND THEY ENACT AND/OR MAKE PERMANENT TAX CREDITS TO DRIVE THIS DEVELOPMENT SO RATE PAYERS DON’T HAVE TO SHOULDER THE BURDEN. Great Stuff! MJC talks of real cost of solar; how about the real cost of coal, oil, and gas still subsidized in the billions by taxpayers. Then figure increased rates of asthma, heart disease, mine-land destruction and global warming. Buildings also often create wind funnels for turbine use. Green roofs(living plants) in less arid geograppy, cool ambient air making solar panels on them up to 25% more efficient, they also take a “dead space” we created on a roof and let it clean air, water and turn CO2 back into O2. We’ve got to work with nature or it will ultimately grind us to dust. I think there are a lot of good comments thus far but like Tim said we need to look at the big picture. First of all I would like to address the nay-sayers when they comment on the idea that solar panels only work during the day. The thing is, as of right now it is not possible to eliminate coal power with one solution. So if we are eliminating a huge chunk of that coal production that is great! We need to think more about how we can keep chipping away at the block. Don’t discourage a great plan like this, think positively. Also for everyone that is all about solar, we need to consider the lifetime of the solar panels and how they can be recycled. I personally do not know how long they last but I have heard that they can not be recycled. These are some issues that we might need to solve before we install 2-square miles of them. So think positively and keep chipping at the coal block by using more efficient appliances, and turning off lights. The energy problem is not going to solve itself. Between these two articles I think we’re off to some great discussion!!! Please keep posting to both and passing along the links to all of your friends so we raise awareness, this is one of the best, and certianly the easiest things you can do for the environment and your wallet, pass these links along to your freinds, and comment! I’m dreaming of the day where one can outfit their house with solar panels and storage batteries to generate all the electrical needs of the home & the car. If you combined this with a little bit of sustenance farming the chains of big business and government would be broken. Well almost, you’d still have to work long enough to pay for these things and even after those things were paid for you’d still have to work, the government, Democrat or Republican, being the evil control freaks that they are, in order to pay taxes. 1.Nuclear power plants use to much water. Six plants in the south east will have to be browned out this summer because of the low water levels. To low to cool their reactors. 2.Uranium cost to much as world demand has risen over 1000% in the last few years. Some say only 30 year supply left. 3.Waste still a Very Real Problem, not smart to just leave it for the future people to worry about. This seems like a great idea and I admire them for doing this. I think we really need to continue brain storming for ideas on funding these projects in such a way that we benefit instead of simply griping about the high costs. I wonder if it could be partially financed by requesting investors to fund the initial cost with a dividend to every investor … that dividend would increase when the units are paid off. New investors, years from now would fund replacement … perhaps at a better cost than today. Set a minimum investment but keep it somewhat flexible so little folks could benefit. Maybe a mutual fund could be started for installation and operation of solar power utility projects. I’d like to see my state employees offered an investment opportunity to cover all state and unversity buildings in Virginia with solar systems. on March 28, 2008 at 7:39 am | Reply TOM MERRITT ISLAND, FL. ONE WONDERS WHAT THE PRICE OF SAND WILL BE, WHEN WE ARE NO LONGER HELD HOSTAGE TO OIL. One thing that no one has mentioned about the rate hikes is that of course the rates are going to go up. Here in San Diego, SDG&E wants to put up the new Powerlink line from the desert around El Centro at a cost of around 1.5 billion dollars. My thing was put the solar up on roofs here to rid us of the ugly stantions. But, think about it, they are not going to support that kind of thinking. If they can’t make a profit, why would they do it? The solution is for some of these solar cell producers to give us a better, more realistic cost so that more and more of us individuals can do it on our own with solar on our rooves. If we wait and depend on the power companies to do it, well, it is going to cost us more than it is worth for the working class. We all want a healthier planet, but we are not going to get it from the power companies or the oil companies. Thus the lobbyists that pay off the politicians to throw up road blocks. Nuclear is great, but we are not recycling our waste, we just bury it. That is a crime and a waste. All about the mighty dollar. A very sad deal. Oh, tankless water heaters are great too, but again, no reason for the expense except greed. There are more parts and materials to a standard 30+ gallon water heater than a tankless unit. Perhaps an exaggeration on the parts part, but definately more material. Give us a break manufacturers. Stack ’em high sell them cheap. Isn’t it better to make a 1% profit from 100 people than 100% profit from 1 person? Right on point and we have exactly what your asking for. The product will be on the shelves soon in your local hardwood store. on April 20, 2008 at 12:08 pm | Reply barak Hu$$ein Osama, Detroit, Muslingan. How much carbon to build these solar panels? How much are we using to get this internet thing up and running, it boggles the mind! Indeed if we don’t do something, the sun is going to explode due to the huge drain on it. I mean if we keep using the sun up at this rate its likely to go super nova. vote for me and I will make sure the sun doesn’t blow up!! Wow i hope that was sarcasim…. Use up the sun o.0 what r u a crackhead?